Smooth green snakes are not ideal pets for everyone, despite their small size that makes housing them relatively easy and their insect-based diet that allows keepers to avoid having to feed them rodents. 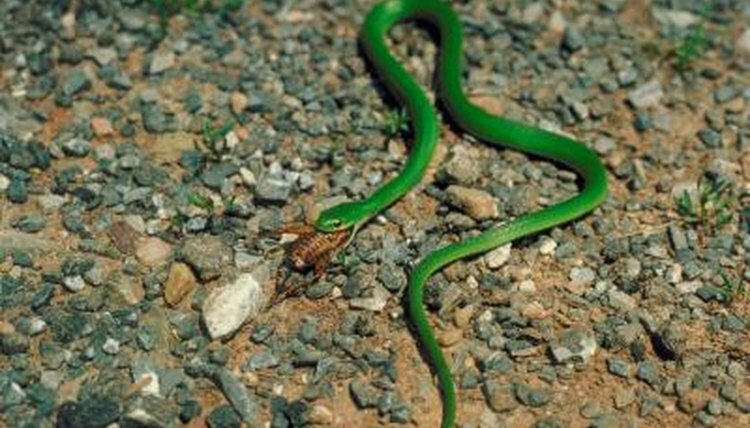 Most specimens offered for sale are wild-caught animals; although they do not often bite, smooth green snakes do not tolerate frequent handling. Smooth green snakes (Opheodrys vernalis) are small, lithe reptiles who live throughout the northern portions of the United States and southern Canada. Isolated relict populations occur in scattered areas of the Midwest and northern Mexico. Smooth green snakes prefer to live in grassy habitats such as meadows, prairies and the margins of lakes, but they also inhabit open-canopied forests on occasion. They are primarily terrestrial, but they occasionally climb into low bushes and shrubs in pursuit of prey. Be sure to check your local wildlife laws before purchasing a smooth green snake, as the species receives legal protection in some areas. Although people who encounter a smooth green snake in the wild may be tempted to keep the pretty reptile as a pet, wild-caught specimens can be problematic for novice keepers. As with all pet reptiles, you should keep captive-bred specimens whenever possible to prevent harming natural populations and to give yourself the best chances for success. Unfortunately, because they are unprofitable, few commercial breeders work with smooth green snakes, limiting your opportunities for acquiring a captive-bred specimen for a pet. If you choose to keep a wild-caught specimen, be sure to have your veterinarian exam him and treat any infections or parasite infestations present. These 1- to 2-foot-long snakes do not require large cages. A 10-gallon aquarium will comfortably house a smooth green snake, but a 20-gallon tank will provide more room for decoration and exercise for your pet. Be sure to use a secure screened lid to prevent these thin snakes from escaping. Use a moisture-retaining substrate such as cypress mulch, and include plenty of live or artificial plants to provide climbing and hiding opportunities. Place a heat lamp at one end of the cage to achieve a thermal gradient, which will allow your snake to move from the warm side of the habitat to the cool side as necessary to maintain his body temperature. Check the warmest spot under the heat lamp with a digital thermometer – the ambient temperatures under the light should be between 80 and 85 degrees Fahrenheit. The ambient temperatures at the cool side of the cage should be in the low 70s. Some anecdotal evidence suggests that regular exposure to full-spectrum lighting provides some health benefits for smooth green snakes, so many keepers opt to provide them with a UVB-producing fluorescent fixture in addition to the heat lamp. Provide your smooth green snake with a bowl of clean, fresh water at all times. To keep the humidity level high and provide water droplets for smooth green snakes, mist the cage regularly with dechlorinated room-temperature water. Do not soak the cage, and allow it to dry out between mistings. Unlike most commonly kept snakes, smooth green snakes consume invertebrates rather than lizards, rodents or birds. You can offer your pet crickets, small roaches, silkworms, non-hairy caterpillars, beetle larvae, moths or katydids. Green snakes require more frequent feedings than most pet snakes; feed them at least three times a week, a few insects per feeding. While snakes are individuals and their temperaments vary, smooth green snakes seldom bite or exhibit defensive behaviors when held. This leads many keepers to believe that their smooth green snake does not experience stress when handled. But this is not the case. Frequently handled smooth green snakes usually become stressed and then ill, and they eventually die. While smooth green snakes are rewarding pets, you should keep handling to an absolute minimum.